LoA_New Djinni's Merchant: Brings You New Items in Best Discount! We bring you new Djinni's Merchant on Dec 18! This time you can check the new-added items in the first page. Secondly, you will experience best discount ever, because we decrease the price for some popular items. Thirdly, some new items will be on sale in this event, such as: Sylph The Conqueror, Flaming Rocket, Lvl. 6 Cherubstone, Lvl. 8 Superior and common Gem Chest, Lvl. 7 Superior and common Gem Chest, Glorystone Chest and more! 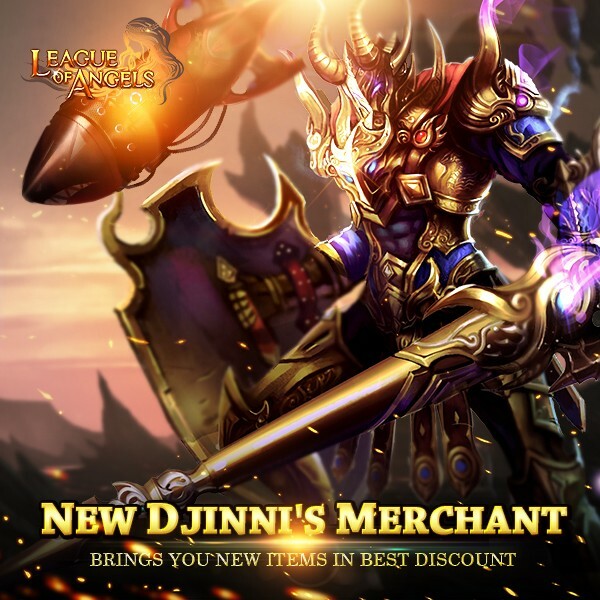 Play LoA now and enjoy the new Djinni's Merchant! Description: Buy items with Darics from the Djinni's Merchants for a discounted price. The discount can be up to 70% off. - Daric can be obtained from Today's Gift, Total Recharge Reward, Gemology , All-Round Talent, Omnipotence and FishingSoul, or exchanging Diamonds or Vouchers at a 1:1 rate. - Click the “Refresh” button for a chance to buy different discounted items. The commodities include The Conqueror, Flaming Rocket, Medieval Armor, Lvl. 6 Cherubstone, Lvl. 3 Holy Crystal, Lvl. 1 Glorystone Chest, Lvl. 8 Superior Gem Chest, Lvl. 8 Common Gem Chest, Lvl. 7 Superior Gem Chest, Lvl. 7 Common Gem Chest, Lvl. 5 Superior Gem Chest, Lvl. 5 Common Gem Chest, Energy Vitamin, Legendary Exp Totem Chest, Rare Exp Totem Chest, Purgatory Soul, Grotto Heart, Energy Card, Enchanted Ore, Element Scroll, Timeskip Scroll, Blessed Stone, Soulstone, Seraph's Stone, Gem Enhancement Stone, Element Crystal, Aegis Shard, Refining Stone, Runestone, Angel Tears, Gold, and many more. Description:Recharge and consume diamonds to buy Darics with a huge discount! More exciting events are coming up through Dec 18 to Dec 21 (server time). Check them out in the in-game Hot Events menu now! LoA_The 14th Cross-Server Team Tournament Coming Dec18th! LoA_Capsule Toys: Brings You Powerful Amazon Soulhunter! LoA_Angel's Quiz: Compete for Wings of Vengeance and More! LoA_Group Buy: Snowball Coming to Celebrate Christmas! LoA_House of Cards: Invite Powerful Dragon Mistress to Your Party!